April 19, 2018 (Greenwich, CT) – The Greenwich Association of REALTORS® announces the statistics for home sales in The Town of Greenwich, CT for the month of March 2018. 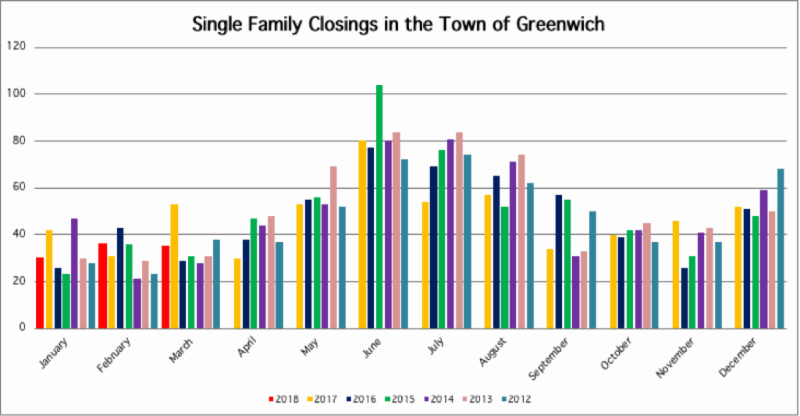 There were 35 single-family residential closings reported during this period according to figures provided by The Greenwich Multiple Listing Service, Inc., the multiple listing service used by REALTORS® in the Greenwich area. The number of single-family residential closings decreased, compared to March 2017 when there were 53 closings in March. The median sale price for a single-family home increased to $2,112,5000 from $1,900,000 the median sales price in March 2017. The average days on the market (DOM) for residential homes was 206 days; which was a decrease from 268 days in March 2017. There were 11 condo/co-op residential closings reported during this time period, which was a decrease, compared to March 2017 when there were 15 closings. “While this sector only represents a small percentage of the overall Residential market in Greenwich, Condo and Co-op Residential closing data has been requested increasingly by Greenwich Association of REALTORS® members and their clients. Given the growth in condo/co-op building in the area and the demographics of current residents, including those who may have already downsized or are looking to in the near future, we look forward to providing more statistical information to help our REALTORS® and their clients in the sale or purchase process,” states Stacey Loh, EVP, Greenwich Association of REALTORS®. The median sale price for a condo/co-op decreased to $655,000 from $749,900 the median sales price in March 2017. The average days on the market (DOM) for condo/co-op residential homes was 322; which was a increase from 108 days in March 2017. “March 2018 sales were in line with last months sales, closing in on thirty-five sales. The median sale price had another pleasant increase from last month and is an 11% increased compared to last year; $2,112,500 from $1,900,000 in March 2017. The Average Days on Market decreased by 23% to 206 this year, from what was 268 days on market last year this time. 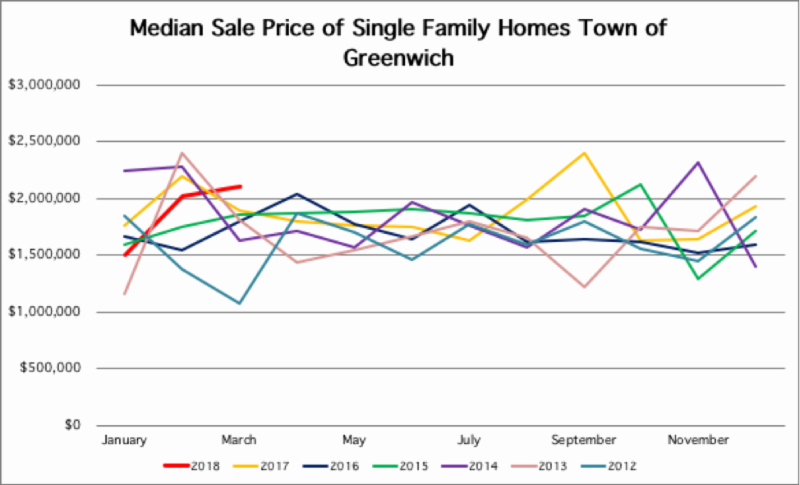 Greenwich continues to be the strongest sector from the begging of the year; Greenwich closed in on nineteen sales, with a 54% median price increase, closing in at $2,700,000 from $1,750,000 from March 2017. 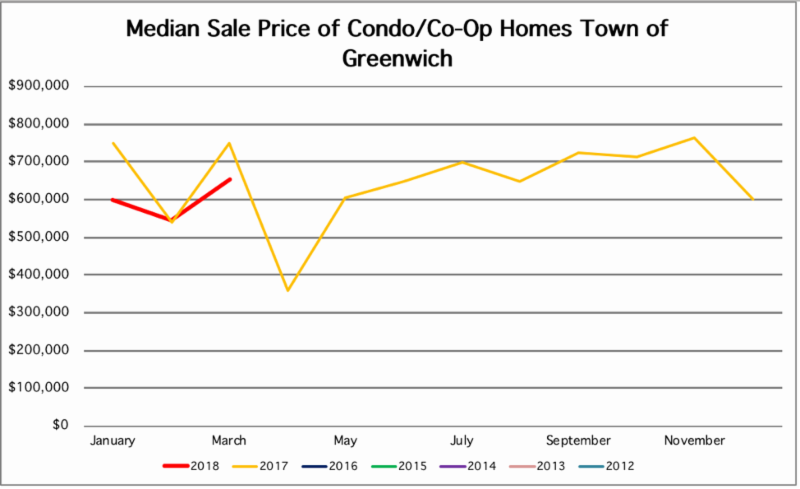 Pending sales in Greater Greenwich (all zip codes) are up 17% YTD.There were 11 Condo/Co-Op sales in March 2018 with a median price of $655,000, with the average days on the market being 322. The spring market has started and we remain hopeful our numbers will increase, as we progress through the spring season,” stated BK Bates, 2018 President of the Greenwich Association of REALTORS®.